From the Basin wharf, this walk heads towards and past the white poles and the large dumpster bins on the right. The walk then continues approximately 50m to the cement road near the information sign of the campsite. 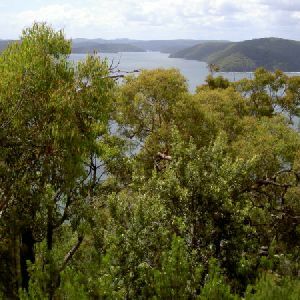 The Basin Campsite, Ku-ring-gai Chase National Park, is a large grassed campsite overlooking Pittwater. The Basin is the only place you can camp in the National Park. However, it has capacity to sleep 400 people and many facilities to adequately cope. The Basin is accessible by has ferry and management trail, but there is no car access. There are numerous facilities such as drinking water, flush toilets, picnic tables, electric and wood barbecues, in addition to cold showers, an amenities block and a soft drink vending machine. There is a large lagoon for swimming, and some nice walks to explore. 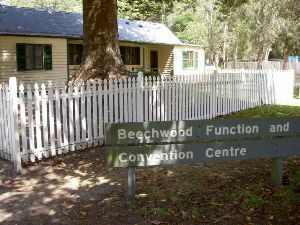 Beechwood Function and Convention Centre, Ku-ring-gai Chase National Park, is a historic building situated next to The Basin camping area. 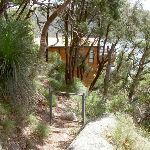 The cottage was built in 1882 by convicts, pirates and sailors living in the area at the time. The cottage is now a venue for hire, with space and equipment to cater for 60 people. More info. 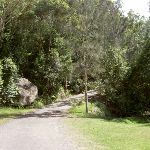 Continue straight: From the camping area, this walk heads up the cement road, following the sign ‘West Head Road 2.4km’ on the information board. The walk heads steeply up the hill for approximately 500m then turns left sharply. The track then becomes dirt as it continues approximately 300m up the hill to the signposted intersection. Veer right: From the intersection, this walk heads up the hill following the sign to ‘West Head Rd 1.9km’. The track continues to climb up the hill, winding as it does so for some time. As the track passes over the hill, it undulates over two hills with views of the sea behind. The track then winds steeply down the hill for approximately 300m to an intersection on the right, marked by a sign saying ‘Mackarel Service Trail’. 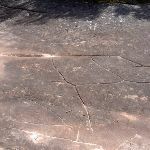 Continue straight: From the intersection, the walk heads downhill along the wide basin management trail, to the signposted intersection with a track on the left, which heads to the ‘Aboriginal Engravings’. 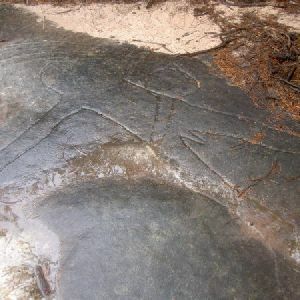 Veer left: From the intersection, this walk follows the ‘Aboriginal Engravings’ sign into the heath and away from the management trail. The track tends right as it follows the wooden edging over the rock surface, between the engravings, to a ramp. The track continues for approximately 10m to the signposted intersection. At the end of this side trip, retrace your steps back to the main walk then Turn left. 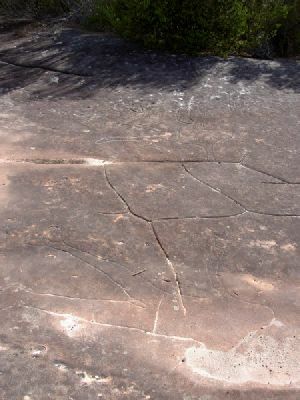 The Basin Track Aboriginal Engravings, Ku-ring-gai Chase National Park, is a large rock surface scattered with Aboriginal engravings. 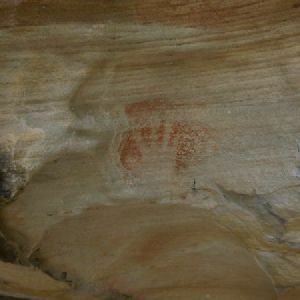 The engravings depict men, fish, hopping wallabies and a club. 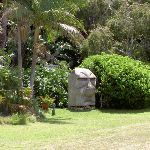 The engravings are marked with interpretive signs which outline where on the rocks the engravings are and how they were made. Turn sharp right: From the intersection, this walk heads towards the sea, following the arrow sign ‘Mackerel Service Trail’. 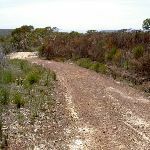 The track meanders down the wide spur for approximately 1km, to then lead along a narrower area of the spur and into a saddle. 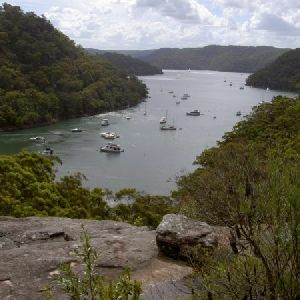 The track continues to undulate to a clearing with a view over Mackerel Beach and Pittwater Bay. Veer right: From the intersection, this walk follows the ridge down towards the sea. 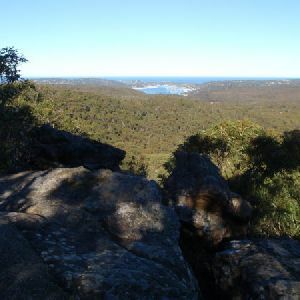 The track winds down the ridge, passing numerous large green water tanks to the left of the track, as the walk continues for approximately 50m to a lookout on a large boulder. The track heads down the left side of the boulder, winding steeply down the hillside to houses. The walk then leads to a small gate on the track in front of a brown wooden house. Turn right: From the gate, this walk heads down the headland away from the house. The track drops down some small rock slopes to continues down the hill side for approximately 200m to Currawong Beach. At the end of this side trip, retrace your steps back to the main walk then Continue straight. 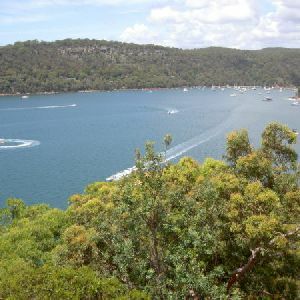 Currawong Beach, Ku-ring-gai National Park, is a 400m stretch of sand looking east over Pittwater. 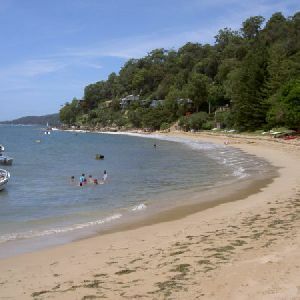 The beach is situated between The Basin and Mackerel Beach. 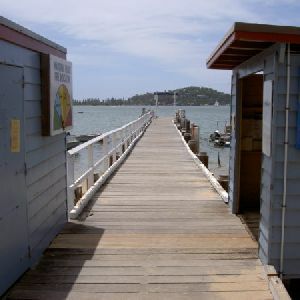 Currawong Beach has a wharf which allows for access via the water. Backing the beach is Currawong Beach Cottages and some steep hills. ‘Little Mackerel Beach’ was purchased in 1949 by the NSW Labour Council for their members. 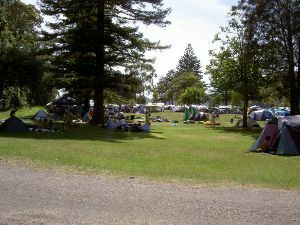 The resort was called Currawong, which is now the common name for the beach. The Currawong Beach Cottages is a small settlement that was purchased by the Labour Council of NSW in 1949. The cottages, tennis court and golf course are now managed by Unions NSW. More info. Turn left: From the gate, this walk heads through the gate, then winds between and under the houses for approximately 200m, coming to a gate before the beach. 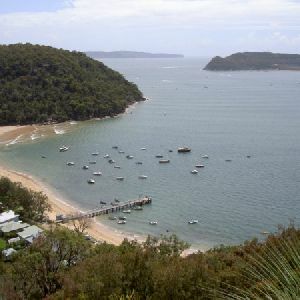 Mackerel Beach, also known as Great Mackerel Beach, is a 600m stretch of sand facing east over Pittwater. The beach is backed by a lagoon and a small community of houses. 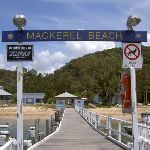 Mackerel Beach has a wharf with public ferry access. 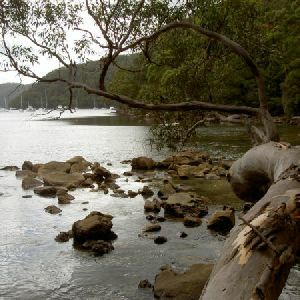 Mackerel Beach and its southern neighbour, Little Mackerel or Currawong Beach, were originally purchased for farming in 1823 by John Clarke. The land was then subdivided and more than a hundred houses were built, many of which still stand today. Veer left: From the gate, this walk heads onto the beach and continues for approximately 300m across the beach to the wharf in the middle of the beach. Turn left: From the wharf, this walk follows the tarmac pavement to the the corner beneath a large, yellow ‘Submarine Cable’ sign. The track then turns right, heading along a grassy pathway of Monash Ave. The walk continues along this for approximately 300m to a bridge. Continue straight: From the bridge, this walk crosses the bridge and leads along the grassy path of Diggers Crescent. 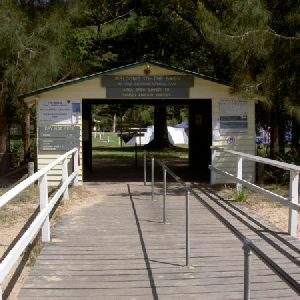 The walk turns right after approximately 100m, then continues another 100m to a large shed, the ‘Mackerel Beach Bush Fire Brigade’ shed. Continue straight: ****Warning: This section of track has been reported as overgrown and no longer passable**** From the shed, this walk passes along the left side of the shed, to a small grassy clearing near a lagoon. 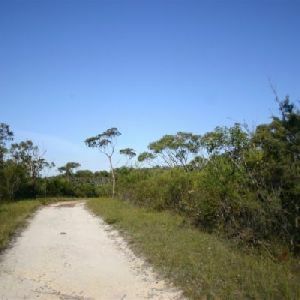 The walk travels alongside the lagoon for approximately 300m, tending right with the lagoon to open onto a sandy creek bed behind the beach. This walk then continues to the right side of the creek, to continue to the two palm trees on this end of Mackerel Beach. A boulder below the two trees is painted with a black arrow. Turn right: From the arrow painted boulder, the walk heads along the beach, keeping the water to the left. After approximately 300m, the walk comes to the wharf in the middle of the beach. At the end of this side trip, retrace your steps back to the main walk then Turn left. 2.6km of this walk has short steep hills and another 1.8km has gentle hills with occasional steps. The remaining (130m) is flat with no steps. 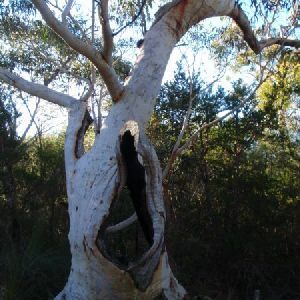 3.8km of this walk follows a clear and well formed track or trail and another 610m follows a rough track, where fallen trees and other obstacles are likely. The remaining (130m) follows a smooth and hardened path. 3.6km of this walk has directional signs at most intersection and another 610m has minimal directional signs. The remaining (290m) is clearly signposted. 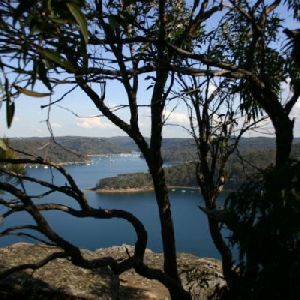 Around 4.4km of this walk requires no previous bushwalking experience, whilst the remaining 180m requires some bushwalking experience. Around 3.1km of this walk has limited facilities (such as not all cliffs fenced), whilst the remaining 1.4km is close to useful facilities (such as fenced cliffs and seats). 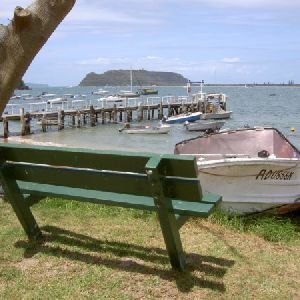 A list of walks that share part of the track with the Basin to Mackerel walk. 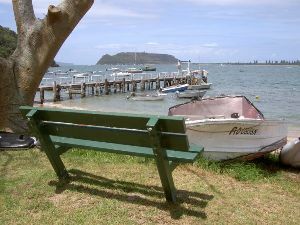 A list of walks that start near the Basin to Mackerel walk. Important Note: There is no car transport option to the end of this walk. 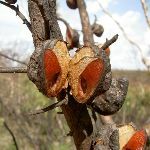 http://new.wildwalks.com/wildwalks_custom/includes/walk_fire_danger.php?walkid=nsw-krgcnp-btm Each park may have its own fire ban, this rating is only valid for today and is based on information from the RFS Please check the RFS Website for more information. This walk starts in the weather district always check the formal BOM forecast or pdf before starting your walk.